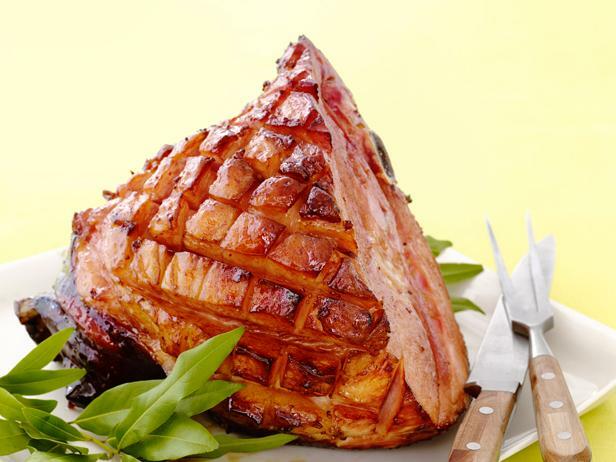 After choosing the best-quality ham, choose one of four mix-and-match glazes for a delicious, customized main dish. Remove the ham from the refrigerator and bring to room temperature, about 30 minutes. Preheat the oven to 325 degrees F. Trim off any skin from the ham. Use a sharp paring knife to score through the fat in a diagonal crosshatch pattern without cutting through to the meat. Insert the cloves into the ham (if using), placing them at the intersections of the cuts. Put the ham, flat-side down, on a rack in a roasting pan. Pour 1/4 inch water into the bottom of the pan. Transfer to the oven and roast until a thermometer inserted into the thickest part of the ham registers 130 degrees F, about 2 hours, 30 minutes (about 15 minutes per pound). Increase the oven temperature to 425 degrees F. Pour half of the Glaze (see below for glazes) over the ham and brush to coat. If the water in the bottom of the pan has evaporated, add more. Return the ham to the oven and roast, basting every 10 minutes with the remaining Glaze, until glossy and well browned, about 45 more minutes. Boil 2 cups apple cider in a saucepan over medium-high heat until reduced to 1/2 cup, 8 to 10 minutes. Reduce the heat to low; add 1/2 cup each apple jelly and maple syrup, 1/4 cup whole-grain mustard, 1/2 teaspoon allspice and 1/4 teaspoon nutmeg. Mix 1 cup light brown sugar, 3/4 cup dijon mustard and the grated zest and juice of 1 orange in a bowl. Toast 2 teaspoons five-spice powder in a small saucepan over medium heat with 1 tablespoon peanut oil, about 1 minute. Add 1 cup hoisin sauce, 3 tablespoons each honey and rice vinegar, 1 tablespoon soy sauce and 1 cup water. Boil and reduce to 1 1/2 cups, about 5 minutes. Grate the zest of 2 limes; set aside. Squeeze the juice into a saucepan; add 8 thin slices ginger and 2 cups unsweetened pineapple juice. Boil until reduced to 1/2 cup, 8 to 10 minutes. Strain, then add the lime zest, 1 cup apricot preserves and 1/4 cup dijon mustard.